Sumit hotel is the budget hotel in Kausani, with all the modern facillities at much economical, reasonable, affordable cost. Sumit Hotel is an extremely enjoyable for family and groups, and offers lunches for forest hikes and treks. During evening you can enjoy bonfire dinners to a Kumaouni Theme with folk dances, rustic music, onsite barbecues for an interesting experience. 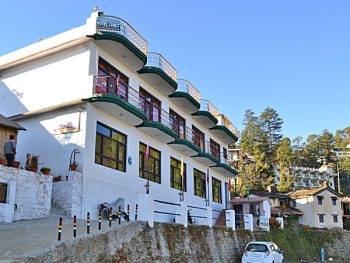 Sumit Hotel is located 0.5 kms from the market, at a very picturesque location in Kausani amidst the lap of nature in a peaceful, calm and serene environment. There are 12 rooms in Sumit hotel are Well designed and furnished and are equipped with cable TV, intercom facility and room heater. The Hotel have multi cuisine restaurant which serves delicious and mouthwatering food to the guests. 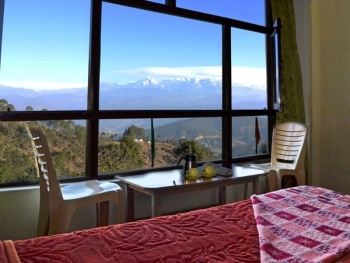 The hotel also offers bonfire meals and kumaoni cuisines on demand. By Road: Kausani is well connected with major destinations like Delhi (419 Km), Nainital (115 Km) And Almora (52 Km). From Delhi, one has to take NH 24 to Rampur, From where NH 87 leads to Almora. A state highway connects Almora with Kausani, 52 Km Away. In case you do not want to drive a car from delhi, catch a bus from Delhi ISBT Anand Vihar. By Rail: The closest railway station is Kathgodam (142 kms) from Kausani. By Air: The closest airport is Pantnagar which is 180 kms away.